KORUZA is an innovative open-source open-hardware wireless communication system, employing a new low-cost approach to designing free-space optical network systems, enabling building-to-building connectivity with a highly collimated light beam at a capacity of 1 Gbps (1000 Mbps) at distances up to 100 m. It is designed to be suitable for home as well as professional users, enabling organic bottom-up growth of networks by eliminating the need for wired fiber connections and associated high installation costs. The simplicity of use, low-cost and compact size allow the system to be deployed in any network. Fast and low-cost Internet access is one of the primary goals of this time. Prompt deployment of information networks in any environment is key to bridging the digital divide, as well as boosting the economic development. "The Digital Agenda for Europe 2020" aims to enable intermediate broadband access (100 Mbps) for at least half of Europe's households, at this time available just for a few due to very high infrastructure costs. Cost-effective, advanced and immediately available access technologies are needed to empower the world to construct the digital future. 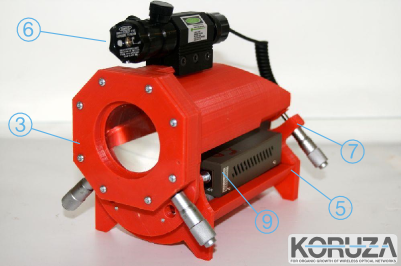 KORUZA is an open-source open-hardware ultrafast networking technology, innovating use of free-space optical networks by using mass produced electro-optical modules and combining them with 3D printing technology, simplifying the overall design. It is suitable for deployment in all situations - from home networks, community wireless networks to service providers. It is primarily designed for urban environments, where Wi-Fi networks suffer from spectrum congestion, disturbing each other and limiting their capacity and reliability. KORUZA is resilient to these problems as its light beam is highly collimated, thus numerous units can coexist in a dense urban area, where the demand for capacity is high and distances are relatively short. It is being developed to be a small and simple unit that can be mounted on a wall, window shelf or a pole, even by untrained professionals without specialized tools. Home users can thus simply establish the connection with a neighbour who has a fiber broadband connection. Community wireless networks can use the system to boost their wireless backbone capacity. Internet service providers can employ it for last-mile access and inter-user connectivity. KORUZA is based on our previous work, a bachelor research project by Luka Mustafa: Very Affordable Laser Ethernet Transceiver, at University College London under supervision of Dr. Benn Thomsen. The results of the development and experimental observations are as well presented in a paper Reintroducing Free-Space Optical Technology to Community Wireless Networks on AMCIS2013 conference in Chicago, scientifically confirming the design approach of implementing modules primarily developed for wired optical networks in free-space optical systems, at a distance of 125 m with capacity 1 Gbps.